Australia regained the Ashes in emphatic fashion, but David Warner believes England are "setting the benchmark" when it comes to one-day cricket. Eoin Morgan's side claimed an emphatic six-wicket victory in last weekend's first ODI in Melbourne, as Jason Roy struck a record-breaking 180 at the top of the order. Since exiting the 2015 Cricket World Cup in embarrassing fashion, England have adopted a much more positive approach in 50-over matches, one that has generally proved beneficial. "They've played a different brand of cricket," acknowledged Warner on Wednesday. "They've been more aggressive up top, and with the ball with a bit of pace as well. "So they're setting the benchmark at the moment." 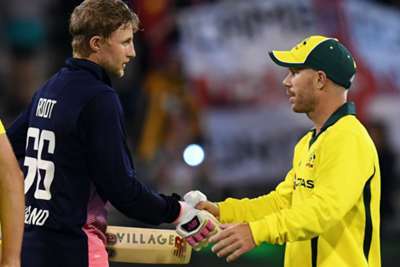 Warner, who will seek to help Australia respond in Friday's second ODI, highlighted the balance of England's line-up as a key factor in their success. "They've got incredible depth with their batting, and they've got plenty of bowling options," he added. "They went into the game the other day with three quicks and two spinners, and if you add Ben Stokes to that line-up, he's an extra quick. "They're in a great space now with their one-day team. I think they've had it for almost two years now, the same team. They're led fantastically by Eoin Morgan as well. "He knows his players; the players know their role in the team and you know what they're going to bring to the table."